I have entered I-Data for different Rock formations which are below Quaternary deposits , so when I am creating sections for this I-Data I am getting correlations including the Quaternary deposits on top of the Rock (I did not input I-Data for the quaternary deposits interval). so how we can show the section excluding this quaternary deposits. How to restrict the I-Data block model (and cross-sections you create from it) to exclude nodes within the Quaternary deposits will depend on the nature of your project area and your other data. > If the top-base depths of your Quaternary deposits are entered in the Stratigraphy table, either as a combined unit or adjacent units, you could interpolate a surface of its base elevations (Stratigraphy | Structural Elevations, choosing the lower or "subface" surface) and use that surface (.GRD file) to constrain the I-Data model. "Constraining" the solid I-Data model with a surface simply tells RockWorks to set nodes above the Quaternary deposit base to null. This is done in the Solid Modeling Options window, via the Model Constraints / Upper Surface option. > If you have a listing of the X,Y,Elevation points of the Quaternary deposit base in the Utilities datasheet, you can use the Map | Grid-Based Map to create a grid surface representing those elevations, and use that .GRD file to constrain the I-Data solid as described above. > You can filter an existing I-Data model with a surface using the Utilities | Solid | Filter | Grid Filters | One Bounding Grid option. You just input your existing I-Data .MOD file, the name of the .GRD file representing the base of the Quaternary deposits, and a new output .MOD file name. Then, use that Existing Model when creating your I-Data | Section diagram. Regarding the legend, the title is hard-wired to plot in the center. In a pinch, you could omit the automatic title for the legend, then add another text label to the diagram (RockPlot2D's Draw | Point Types | Text) at the desired position. While there are methods to copy your lithology data to the stratigraphy table, the more important question is whether the lithology materials are consistent with the requirements for stratigraphic formations - consistent in ground-downward sequence in all holes, not repeating within a hole, etc. Before you go to the trouble of organizing the lithology material into stratified units for the sole purpose of getting a surface for filtering your I-Data section, there may be other options. 1st suggestion: If you have an existing lithology solid model (.MOD file) which illustrates the boundary between the Quaternary deposits and underlying rock, you may be able to use the Lithology | Superface menu option to create a surface which represents the top of the underlying rock, which you would then use to constrain your I-Data model. (The lithology .MOD file can be generated using the Lithology | Model or Profile or Section or Fence menu options.) The Lithology | Superface program extracts the elevations for the uppermost occurrence of a specified rock type from the .MOD file and stores these in a .GRD file. Any locations where that rock type does not occur, there will be a hole (null value) in the output surface. Note that if the underlying rock is comprised of > 1 lithology type along the contact, thus generating holes in the output surface, then you'll need to filter the lithology model to reassign all nodes below the contact (e.g. not-Quaternary deposits) to a single G value, to then extract the contact surface. To offer better suggestions, it would be very helpful to see your data; we can move this from a forum discussion to a support issue. The best way to supply us your project data is via the Project | Archive Data to ASCII and email the resulting ZIP file to support at rockware.com. Thanks for your suggestion I will try it tomorrow, the idea of copying the lithology table to the stratigraphy is because the lithology is very simple and consistent in all BHs, w Quaternary deposit above a Limestone Formation with different grades of weathering and strengths and in some spots we have a calcarenite, so after copying the table I could keep only the limestone below the quaternary deposits and assign the same G value to the calcarenite and then generate the .grd file, but your suggestion seems to be faster so I will go first for it. Nevertheless I would like to know how we can quickly import tables (not with copy past from excel files). 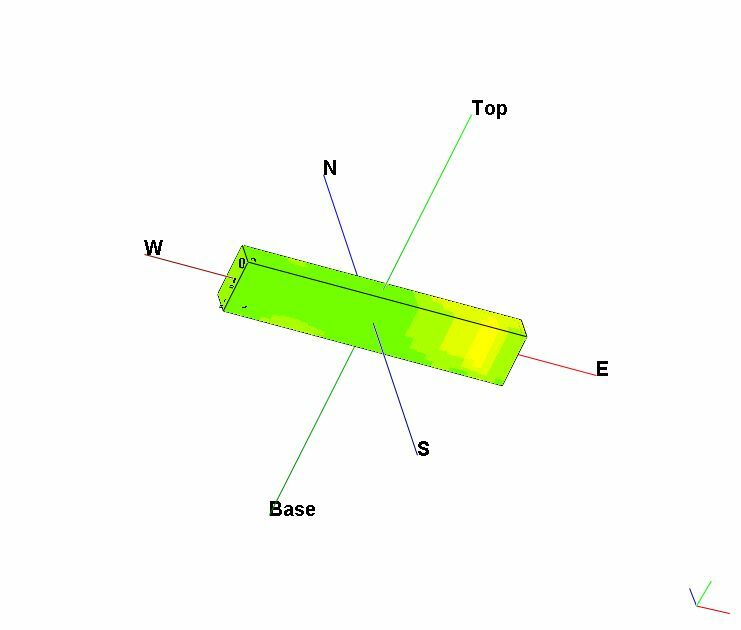 The second aspect where I need your support is for volumes calculation, actually I have a 3D-model built with I-Data, the I-Data correspond to 5 different classes of material, so after creating the 3D-model, can we display only one class of material and then calculate the volume of each class....? 1. Choose the Borehole Manager's File | Export | XLS, choosing All Boreholes (or Enabled, as appropriate), and expanding the Items to Include heading to select Lithology Types, Locations, and Lithology only. When you click Process you'll get an Excel spreadsheet with 3 worksheets: one with Locations, one with Lithology data, and one with the Lith Types. 2. In Excel, rename the "Lithology" worksheet's name to read "Stratigraphy". Rename the "Lith Type" worksheet to "Strat Type". Be sure the "G Value" column in the Strat Type worksheet numbers the units from ground-downward, starting at "1" and increasing. Save this spreadsheet in your project folder. 3. 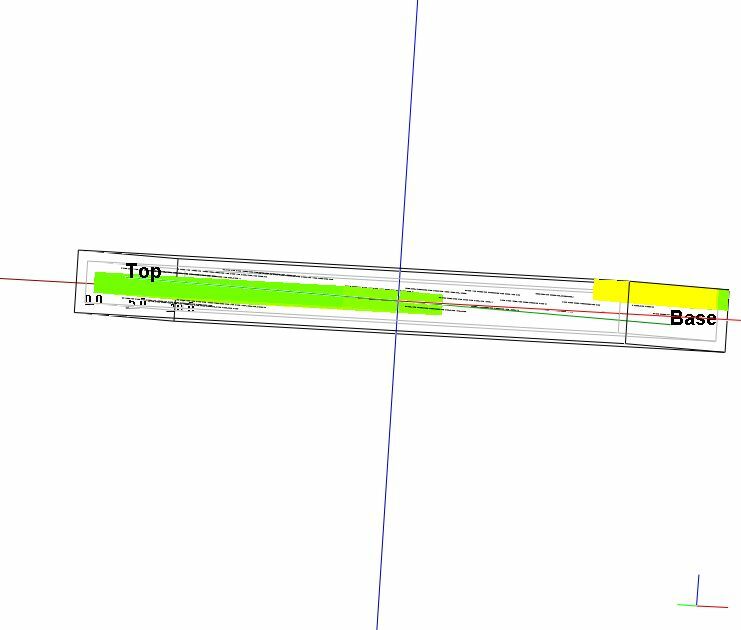 In RockWorks, choose the Borehole Manager's File | Import | XLS menu option. Click Yes for backing up your database. Browse for the name of the spreadsheet. The fields on the main tab will map automatically. At the bottom of the tab - AND THIS IS IMPORTANT - choose Update Existing Record. Click on the Block Selection tab and be sure the three worksheets mapped automatically to the Strat Type, Location, and Stratigraphy data tables. 4. Click OK. RockWorks should import the intervals into the Stratigraphy data tables. 5. Click on the Stratigraphy Types button, at the top of the Stratigraphy data table, to be sure the formations are ordered correctly, and are using the desired colors/patterns. Regarding visualization of your I-Data ranges: You can adjust the range of values which are displayed in RockPlot3D and view the volume represented. If you need to adjust the value range from both the bottom AND from the top of the range, be sure to visualize the solid model using All Voxels (rather than as an Isosurface) - use I-Data | Model, choose Use Existing Model, browse for the .MOD file name. Under Create 3-Dimensional Diagram, choose All Voxels. Click Process. Once displayed in Rockplot3D, double-click on the voxel model icon in the data tree to access its display options. Insert a check in the Filter box and use the Low and High slider bars to adjust the values to be displayed at any one time. The Show Volume checkbox can be activated so that the model volume is updated based on the visible voxels. Thanks for all the tips, everything worked fine with you suggestions. Can we create a customized (polygonal shape by entering all x,y coordinates) 3D I-Data solid model ?? by doing that it will be easy to calculate volumes of different I-Data ranges as you explained me in your previous post. So actualy I have 2 sections. one is rectangular so the solid model and volume calculation for 3D I-data was easy using your suggestion but now I have another section were the shape is polygonal what is the best way to create the 3D I-data model and calculate different volumes (based on the obtained solid model) afterwards. The RockPlot3D display of a solid model (.MOD file), either as a voxel display (blocks) or as an isosurface display (a skin) allows you to filter the model to display areas of specific concentrations. When you do this, the volume of the visible display is shown. If you need to first filter the solid model based on a polygonal outline, for example to null-out nodes that lie outside a property boundary, you can use the Utilities | Solid | Filter | Polygon Clip menu option. This tool assumes vertical walls downward from the polygon. Displayed volume will be updated based on the visible nodes. Yes. You can create any number of "Polygon Tables" in the database which can then be used to filter solid models (Solid | Filter | Polygon Clip) or grid surfaces (Grid | Filters | Polygon Clip). You can access these Polygon Tables via the Project Manager (left side of program window), under Misc Project Tables. You can hand-enter or copy/paste the XY coordinates for vertices into the Polygon Table. Or you can draw a polygon shape onto a map in RockPlot2D, then save that polygon's vertices to a new Polygon Table. I should also mention that you can apply a polygon filter when you're creating your I-Data model in the first place. In the Solid Modeling Options window, look for the Polygon Filter under the Model Constraints. When you activate that option you can then browse for which Polygon Table to use to constrain the model, and specify whether it is the interior nodes or exterior nodes to be blanked. I have created tables to filter different sections of the model and it worked fine except for one section (attached the model and the filtered model 3D and a plan view of it ), where nodes inside the polygon are excluded so that I have a gap in the middle of the model, I have changed the polygon table by giving more easting and northing coordinates and every time I have different output but still nodes lying inside the polygon are missing and then showing a gap between both sides of the model. It looks like the software cannot close the polygon with only 4 corners coordinates if they are not on a same northing or easting !!!!!. Do you have any explanation or there is any setting that we have to consider? My second question is concerning exporting 3 D solid models in DXF file, I have tried but the output was showing in Autocad only a 2D grid??? Would just to precise that actually I found out that some coordinates where not in order so but after rearranging them the gap was very small but still there (see attached plan view of the model and view of the polygon only). 1. 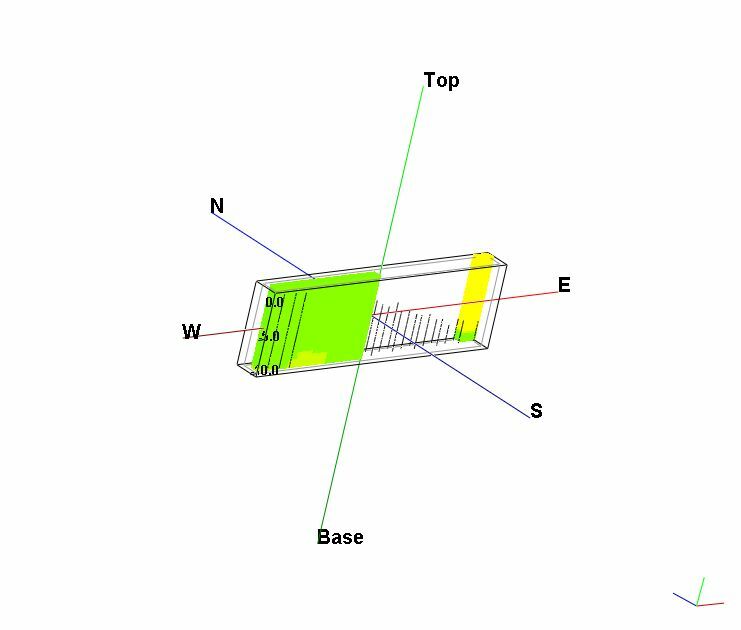 Open your Polygon Table to view the coordinate listing. 2. Click the Plot button along the left side of the table. 3. Choose the display options you like for the polygon outline and click Process. 5. Export the polygon outline to RockPlot3D using the File | Export | RockPlot3D option. Choose to Float the polygon at the uppermost elevation in your model (or even slightly above that). 6. When displayed in RockPlot3D, use File | Save to save this view of the floating polygon. 7. Use File | Append to append a saved view of your clipped model. 8. Adjust the view so that you can compare the placement of the polygon versus the clipped model. 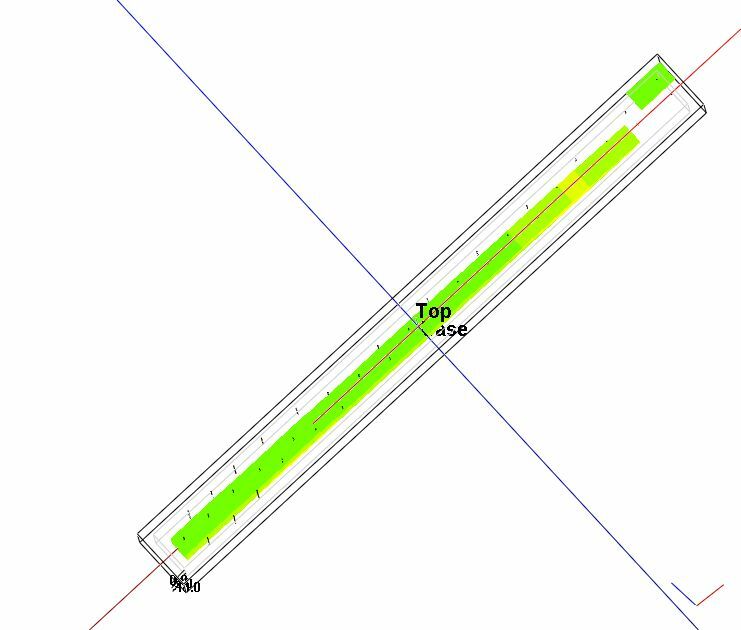 If you need to redefine the polygon vertices, you can use the digitize tool in RockPlot3d to determine the XY (and Z) coordinates for any point in the display. You should also check the XY node spacing of your solid model - is it fine enough to allow close filtering to the polygon boundary? Regarding export to DXF, it should be a 3D output. Note that you will get slightly different results in the output file depending on whether you are viewing your model in RockPlot3D as an isosurface display or as an all-voxel display. If you would like for us to take a look at your project data, please contact me at molly at rockware.com for instructions. Everything worked fine after reducing the nodes spacing.